In 2015, the Chinese film industry’s box-office receipts skyrocketed nearly 50% and the recent Chinese New Year/Valentine’s Day seven-day take produced a new record of over a half billion dollars, beating the haul that was brought in during the opening week of the latest Star Wars film. 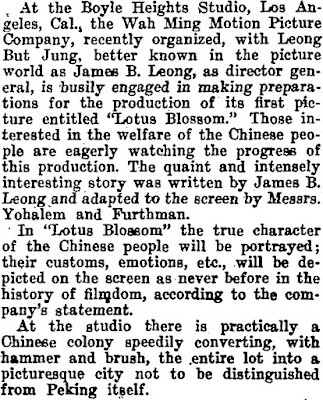 In light of these leaps and bounds, it is interesting that, nearly a century ago, a Chinese-American entrepreneur, James B. Leong, became a pioneer in his field when he made Lotus Blossom, a 1921 film made here in Boyle Heights. Boyle Heights Historical Society Advisory Board member Rudy Martinez has extensively researched the making of Lotus Blossom and here is the first of three parts of the series. James B. Leong, producer of Lotus Blossom, ca. 1920. From the Los Angeles Herald-Examiner photograph collection, Los Angeles Central Public Library. Click on any image to see them in enlarged views in new windows. A short time later, the company announced that the first film they would produce would be based on an old Chinese fable and would be titled Lotus Blossom. With a production budget around $125,000, and using a mostly Chinese and Japanese cast, this ambitious new production company was aiming to make its first film a period costume feature on the same level of the work of other major studios. Although this silent film is little known today by the general public, film historians recognize Lotus Blossom as an important contribution to the heritage of American cinema. This Boyle Heights-based production is considered the first feature film to be produced and commercially released by Chinese Americans. A nationwide publicity campaign included a float for a local motion picture parade and a lavish theater lobby display during its Los Angeles world premiere in November 1921. Also noteworthy was that the movie featured an actor, Lady Tsen Mei, whom many considered to be the first Chinese screen star in American films. 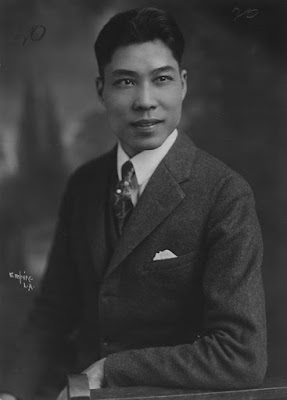 James B. Leong was born Leong But-Jung in Shanghai, China in 1889 and emigrated to the United States in 1913. After briefly attending an Indiana college, Leong relocated to Los Angeles in 1914 and worked in the film industry as a translator and technical adviser in productions employing local Chinese as extras. He was reportedly an uncredited assistant director for D.W. Griffith's Broken Blossoms (1919). In its May 22, 1920 edition, the Los Angeles Herald reported the creation of the newly-formed company, James B. Leong Productions. The officers were Leong, president; Dr. Sui Chong, secretary; Low Song Kai, treasurer; and T. A. Russell, director. The firm’s office was at 804 North Broadway. For a year, Leong worked on several original scripts with such titles as Devil's Paradise, and Chinese Princess of Mexico. 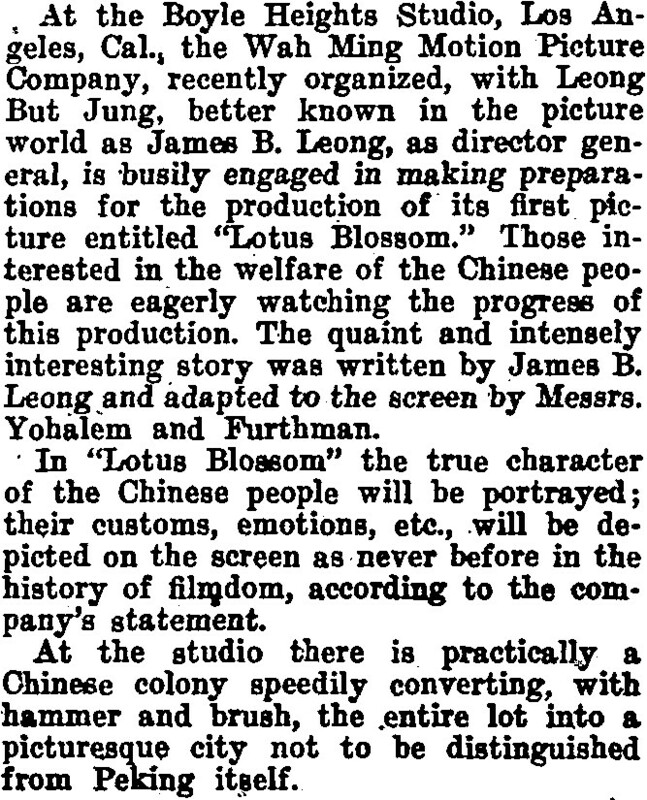 An article on the filming of Lotus Blossom, New York Clipper, 22 June 1921. From Chronicling America, Historic American Newspapers, Library of Congress. In its issue of June 22 1921, the New York Clipper published a brief description about the work taking place in Boyle Heights just before filming began on Lotus Blossom. By this time, the company had been rechristened The Wah Ming Motion Picture Company. With a flair for showmanship, the producers stressed the unique aspects a Chinese American company would bring to the film, as well as hinting at the physical scope of the production taking place on the Boyle Heights studio lot. Technically speaking, Lotus Blossom is not the first film produced by Chinese-Americans. Marion Wong’s The Mandarin Film Company, based in Oakland, produced The Curse of Quon Gwon: When the Far East Mingles with the West (1917). Written, directed, and co-starring Wong, the film appears to have encountered difficulties in publicity and distribution. No evidence exists that it was ever commercially released except for a one-time public screening in 1948 in Berkeley. Only two surviving reels of what was probably a six-reel feature exist today. When Wah Ming began work on Lotus Blossom in May 1921, there were two studios in Boyle Heights. The two-acre Majestic Studio lot on Fairview Avenue, where Interstate 10 cuts through the Mount Pleasant Tract, was initially established in 1912 by the IMP Film Company and headed by future Universal Studios co-founder Carl Laemmle. It was here that Charlie Chaplin made several films in summer 1915. The other facility was the former Bernstein Production Studios, established by Isadore Bernstein in 1917. This eight-acre lot was located at the northwest corner of Boyle and Stephenson (now Whittier Boulevard) avenues. It was at this location (click here to see what the property is like today) that Wah Ming set up production and made Lotus Blossom. 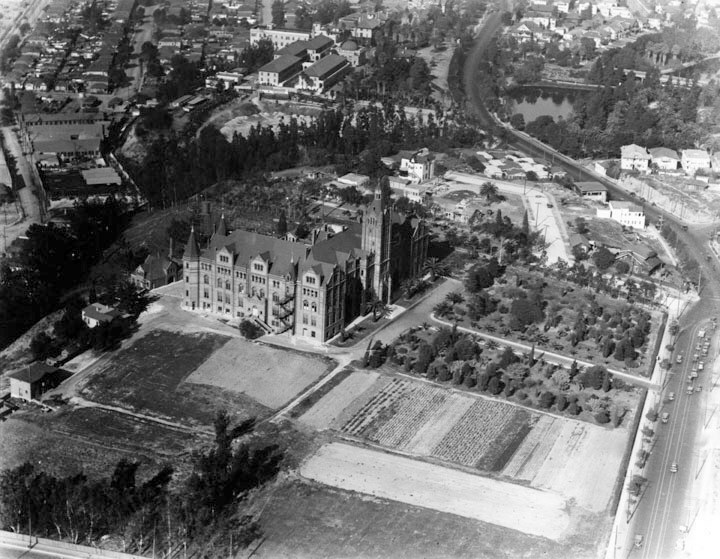 This 1924 aerial photo shows the landmark Los Angeles Orphans Asylum at the center. The lot above that is the site of the Perry-Davis Mansion and what was the Bernstein Studios and the Wah Ming Motion Picture Company. Lotus Blossom was filmed here in 1921. At the upper right corner is the lower portion, including much of the lake, at Hollenbeck Park. Boyle Avneue runs in a curved line at the right. From the Los Angeles Central Public Library Photograph Collection. Decades before it was a studio lot, the property was the site of one of the most lavish estates in Boyle Heights. In the early 1880s William H. Perry, lumber baron, organizer of Los Angeles' first gas and water utility companies, and a Boyle Heights resident (his home is now at the Heritage Square Museum in Lincoln Heights), had an opulent home built here for his daughter, Mary (or Mamie), and her husband Charles Davis. Charles died in 1885, and Mary married again in 1888 to Charles M. Wood. They lived on the estate for perhaps a year or so, before it passed to a succession of owners, including Fidel Ganahl, founder of Ganahl Lumber Company, which still exists today. When Bernstein purchased this parcel in 1917, the former Perry-Davis/Ganahl mansion was still standing (it was later razed) and both the Bernstein Studios and the Wah Ming Motion Picture Company used it as their production offices. A further Hollywood connection to the Perry-Davis estate was that Charles and Mary Wood's daughter, Elizabeth, married James Stack, and their son, born in 1919, would become the well-known Oscar-nominated actor, Robert Stack. (click here to read a previous blog post with more detailed information on the Perry-Davis estate and the Bernstein studio). Coming soon, part two of the story of Lotus Blossom! Fascinating! Thank you for sharing this. Very interesting! Thanks for the link Rudy! James B Leong is my grandfather! I am very happy that his contributions to thr movie industry are being recognized. Thank you for the detailed research! Is there any chance to have the contact information of Mr.Rudy Martinez? A Chinese film historian would like to contact him about the article.